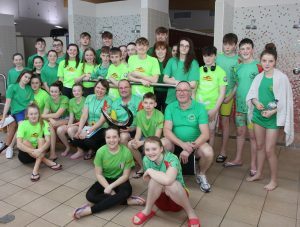 ST Fiacc’s swimming club in Graiguecullen held their 25th anniversary swimming gala in Athy recently. The gala was a celebration of 25-years of club activity, as well as being a competitive event run under Swim Ireland rules. Races of between 50m and 400m were swum, across the four swimming strokes, along with medley events. Over 200 high-level swimmers from all over Leinster competed at the event. Competition was fierce amongst the swimmers in pursuit of medals, with St Fiacc’s swimmers taking home 75 medals, including 28 golds. The highlight of the day was a presentation to longstanding club coach Tony Kirwan to acknowledge his service to the club since its inception. For 25 years Tony has coached and developed hundreds of young St Fiacc’s swimmers. He continues to work tirelessly on behalf of the club, coaching the C and D squads as well as the adult masters group. St Fiacc’s is Carlow’s only swimming club and offers Sunday morning children’s lessons, competitive swimming, and adult masters swimmers sessions. Further information can be found at www.stfiaccs.ie.